Global economic growth spurs oil demand. Elasticity of Oil supply - very inelastic. Higher prices do not significantly increase oil production. Elasticity of Oil demand - very inelastic. Higher prices do not significantly deter oil consumption. Oil production - near peak. Spare production capacity acts as a cushion in the oil supply chain. 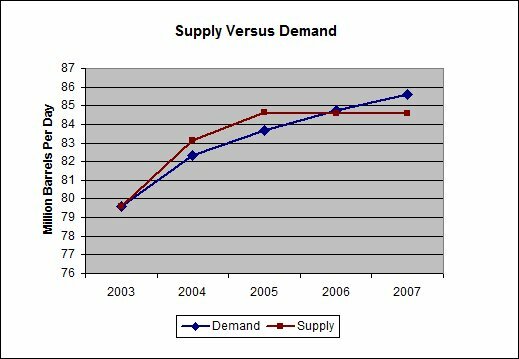 A lower spare capacity diminishes the ability to absorb supply-demand shocks, leading to higher price. Oil refining capacity - near peak capacity. Oil shipping capacity - near peak capacity. It is thought by some that we are in Peak oil since 2006. Peak oil is the point in time when the maximum rate of global petroleum extraction is reached, after which the rate of production enters terminal decline. Peak oil is not about running out of oil, it's about the rate at which oil can be supplied to the market. If the rate at which it is demanded exceeds the rate at which it can be supplied, oil prices will go up. In an attempt to stimulate the ailing U.S. economy, the the Federal Reserve has cut rates by three percentage points since September 2007. But the rate cuts are also inflationary, weakening the dollar and sending oil prices higher. Since the oil price is indexed to the dollar, as the dollar drops in value, the price of oil increases. If one looks at inflation adjusted oil prices, they remain relatively flat. As the dollar continues to depreciate in value, investors have bought oil futures as a hedge against inflation. It is thought that as much as 60% of today's crude oil price is pure speculation driven by large trader banks and hedge funds. Oil prices are high because the United States is actively engaged in wars in Iraq and Afghanistan and perusing war with Iran in the middle east. "Resource nationalism" and political tensions in Nigeria, Venezuela, Iran and even Mexico are further constraining supply. These oil producing countries would like to use the oil in their countries to develop the country rather than to make the oil available to world markets. 1973, Oil shock. The fourth Middle-East Wars acted as trigger. 2007, Peak oil. World oil production peaked. 2008, The oil price has been steadily increasing and hits a record high at $147.27/barrel. This page was last modified on 4 February 2010, at 15:46.